Home » Hybrid » Cruze Air Shutter System Destined for Volt? Cruze Air Shutter System Destined for Volt? Squeezing out every last drop of fuel efficiency is one of the key tasks for Greg Fadler, aerodynamics engineering group manager at Chevrolet. Fadler and his team worked on making the 2011 Chevrolet Cruze Eco one of the most fuel-efficient small cars on the market, achieving up to an estimated 40 MPG on the highway – hybrid-like efficiency without the hybrid cost. Engineers used some of the proven approaches to making the Cruze Eco a gas sipper, trimming its overall weight and lowering the ride height. But the real innovation is behind the front grill where an automatic air shutter system allows the car to change shape and cut through the air more smoothly. The air shutter system uses sensors to feel and sense wind and temperature conditions. The sensors are married to electric motors that open and close the shutters automatically. With the shutters closed at high speeds, wind drag is reduced. At lower speeds, the shutters open to maximize engine-cooling air flow. The air shutter system contributes nearly half a mile per gallon in combined city and highway driving. The cooling systems for all GM vehicles are designed for the worst-case scenario, which is pulling a trailer up a grade in Death Valley. The shutter allows them to significantly improve fuel economy, while still providing the cooling needed in that extreme case. “The real fun of the job is when we discover something new or innovative that allows us to do something better than we or our competition has done before,” Fadler said. 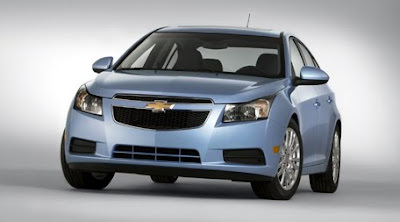 The Cruze and Volt share the same platform, in fact early test mules for the Voltec powertrain were Chevrolet Cruzes. The Cruze has been rumored to be in line for the same powertrain from 2012 on, so there seems a good chance we might see this air shutter system on GM Hybrids in the not too distant future.